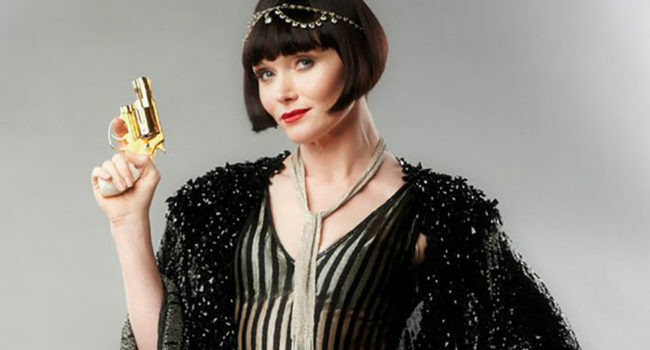 A glamorous, charming, wildly independent female private detective in 1920’s Melbourne, Phryne Fischer (Essie Davis) solves crimes with wit, smarts and fabulous clothes on the Australian TV series Miss Fisher’s Murder Mysteries. Phryne is a wealthy woman with no intention of marrying and who loves interfering with the cases of local Detective Jack Robinson. To portray this vivacious woman, put together a high-fashion 1920’s inspired outfit complete with a short black bob, sparkling hair accessory and purse pistol. In Backstrom, Lieutenant Everett Backstrom (Rainn Wilson) is a crotchety yet brilliant policeman who heads the Special Crimes Unit. Always armed with a cigar and coffee, he is self-destructive and offensive. While he is not everyone’s cup of tea, he is everyone’s first choice to solve crimes. In the HBO series True Detective, Detective Rustin Spencer “Rusty” Cohle (Matthew McConaughey) is brought in as partner of Detective Martin Hart (Woody Harrelson) to solve a ritualistic murder in rural Louisiana. Dress up as either the buttoned-up 1995 Cohle or the broken-down 2012 version who’s now a suspect. Life in California can be tough for a teen, especially when you spend your free time investigating various crimes, including the murder of your best friend. When she’s not spending time in her dark room, you’ll find Veronica hanging with biker gangs or her bestie, Wallace. If you find yourself in trouble, you better enlist the help of the former popular girl turned private eye.